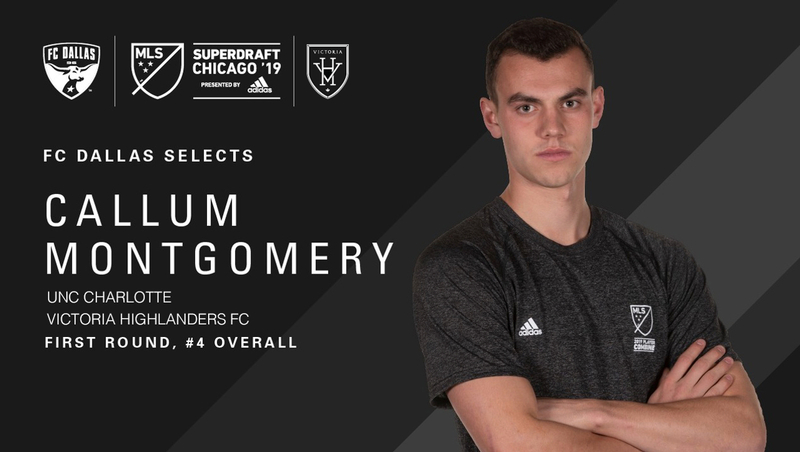 Victoria Highlanders captain, VI Wave alum, Callum Montgomery was the fourth overall pick by FC Dallas in the 2019 Major League Soccer SuperDraft held today in Chicago. "It has not sunk in yet, it is a dream come true," Montgomery said. "This is a great day for me and my family; I want to thank everyone that helped me get here." Montgomery, who grew up in Nanaimo, is the fourth Highlander to have been picked in the MLS Draft. Riley O'Neill (2007, Colorado Rapids, 34th overall), Josh Heard (2016, Vancouver Whitecaps, 71st overall), Matt Polster (2015, Chicago Fire, 7th overall). "We are all so proud of Callum's accomplishment " managing director Brett Large said. "He deserves this opportunity as he's put in all the hardwork and effort over the years. We've seen him grow as a player but also as a young man. He'll be a wonderful ambassador for our soccer community outside of Victoria and will slot into the Dallas team well." In December, Montgomery was named first-team United Soccer Coaches Association All-American. He also was named CoSIDA Academic All-American for the third time in his career. Montgomery played an integral role in helping the 49ers earn a national ranking for the majority of the season, reach the Conference USA Tournament Championship game as well as the second round of the NCAA Tournament. This past season, Montgomery, who earned the Supporters Player of the Year award in 2018 ran the gambit for collegiate accolades. He earned first-team All-Conference USA honors as well as being named to the Conference USA All-Tournament team. Montgomery was also a semifinalist for the MAC Hermann Trophy, which is awarded to the top player collegiate soccer. The senior defender was named Conference USA Defensive Player of the Week two times this season (August 27 and September 17).